"Wilderness is a necessity ... They will see what I meant in time. There must be places for human beings to satisfy their souls. Food and drink is not all. There is the spiritual. In some it is only a germ, of course, but the germ will grow." “The mountains are fountains of men as well as of rivers, of glaciers, of fertile soil. The great poets, philosophers, prophets, able men whose thoughts and deeds have moved the world, have come down from the moutnains — mountain-dwellers who have grown strong there with the forest trees in Nature’s work-shops." The earth, a dirty rock in the sky of the universe. Layered by mountains, trees, rivers, oceans. Miraculous, yet fleeting. We pile on layers of pavement and buildings and cars and technology. We carve out squares and holes for the earth to breathe through. A flower pot, an earthly decoration acts as a faint reminder of our home's natural beauty and power. I'm writing in response to the lack of regard I've previously had for this gift known as earth. I would've typically considered myself someone who spent a substantial amount of time in the wilderness comparative to my own generation. Weekend trips to the woods were common, a monthly occurrence. I played outside as a kid. The oppression of technology feels real to me. I called myself well-balanced, and by the standard I was. Then I experienced a deeper level of humanity in the wilderness that only comes with time. I felt the relentless empowerment and freedom of the wilderness and recognized it's rarity in my own life. This may not mean much to you, but it makes me very concerned. I'm concerned for our generation and future generations, if we fail to experience the glory of the natural earth and its wilderness, how will we know to fight for its protection? Logically, it's fairly obvious to conclude that we should fight for sustainability. It's beyond just sustainability, we should fight for the emotional, spiritual, and physical power of the wilderness and ensure access for everyone. Our interaction with the natural world acts as a core part of our humanity, yet the world currently being built for ourselves rapidly tears us away. This sentiment comes from what I've gained from my relatively short time in the woods thus far; a therapy in which I'm humbled and empowered. I want that for every single human on this earth. I want to figure out how to make that happen. As I mentioned in my previous post, my mind drifts through my past, present and future. What's my purpose? What am I fighting for? The answers don't come quickly or easily, but I've resolved to fight for the wilderness. Although plenty of other hopes, dreams, and causes fill my heart, this feels like an attainable starting point. It's straightforward: make an effort to help people experience the wilderness and protect it with reverence. That I can do. My hope is to exit this journey with multiple directions that align my passion, convictions and gifts. It's reassuring to identify a goal and feel complete and utter confidence. 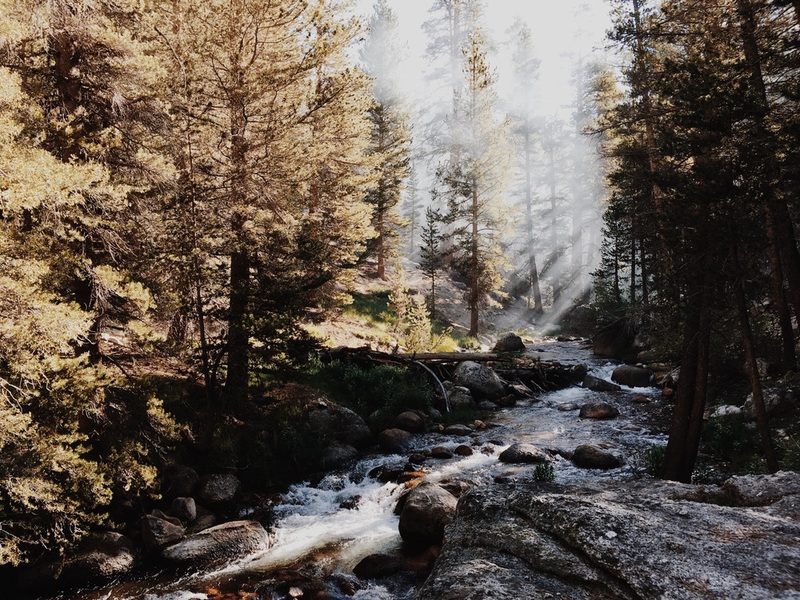 I hope this blog in its own little way, can at least help us all to better understand the beauty of the outdoors and to go out and experience it. In other news.. A new chapter has begun on the trail: The Sierra. We are finished with the desert. Praise the Lord. We have entered the Sierra, which has had notable differences. Not only are the views insane, with taller mountains and trees in every direction, (as you can see from the photos in the post) we no longer worry about carrying massive amounts of water because rivers and streams generally flood our path. Socially, the desert was, well.. a desert. As I mentioned previously, we lost our hiker family fairly quickly when we jumped off for some off-trail commitments and anyone else we met was often done in passing. 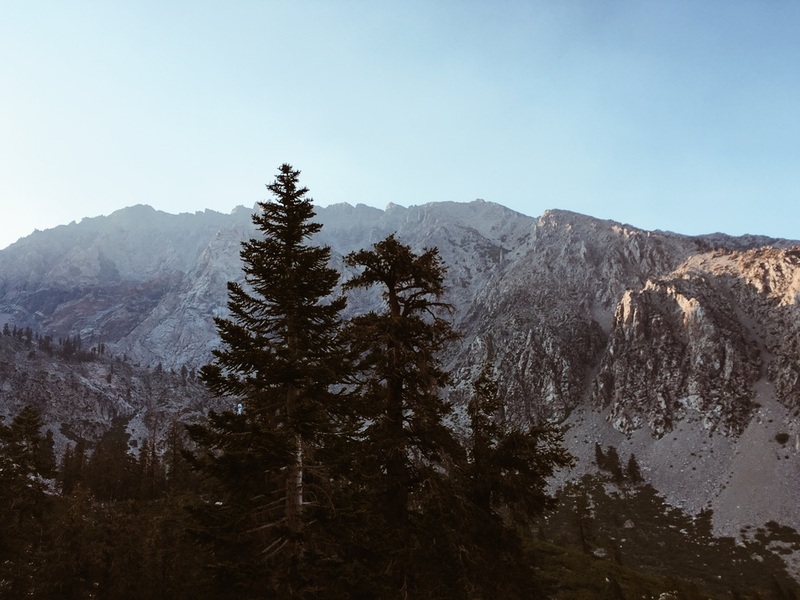 Since being in the Sierra, socializing occurs much more frequently, which has made us much less zombie-like when we come in contact with humans. The solitude of the desert had its fair share of benefits, but another 3 months of that may have driven me insane. Chapters of solitude will come again I'm sure, but as for now, we've appreciated making new friends instead. We were able to rally a crew to hike to the top of Mt. Whitney to witness the sunrise. We peeled ourselves out of our sleeping bags at 1:30 am, hiked 8 grueling miles to the highest peak in the lower 48 states. It was worth it. We sat atop the mountain for hours, drinking wine at 8 am in the morning, squinting at the sun and ducking behind rocks to break the cold wind. 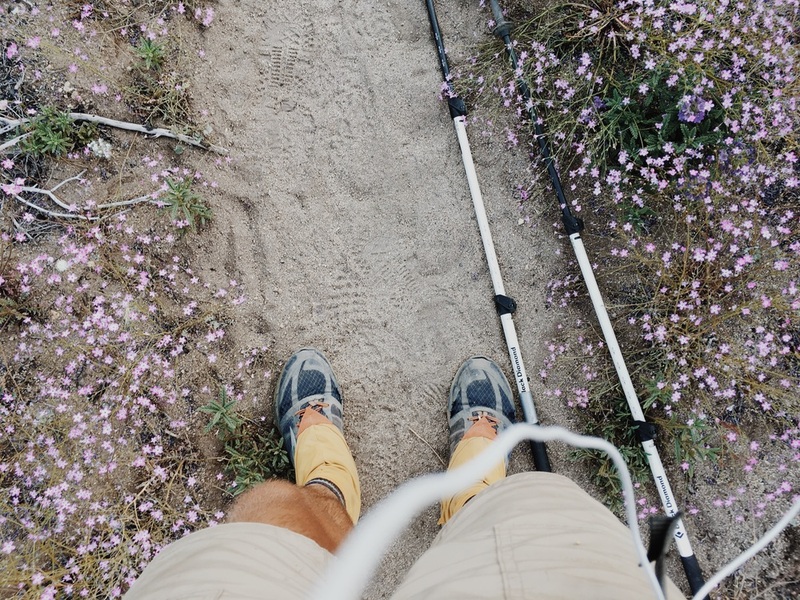 As we sat, one of our friends, Barrett also known as "Sweetheart" read us his ode to the PCT. I thought I'd share a piece because it was absolutely beautiful. "You'll make yourself mad by talking in circles, and when you think you're finally done, you'll end up just saying it all aloud to the creatures around you. Clarity finds you when you're ready to be found, and dancing and screaming at the top of a mountain will remind you what happiness truly is. Strangers become family in the matter of days. You'll forget about home, and then really miss it. Any fear, doubt, and negative thing you've ever experienced will be brought up, and all of a sudden you'll be by yourself on a rock that isn't so comfortable with a backpack that's too heavy ready to move forwards in every possible way because you know everything is finally let go, you're free, and comfort is not a necessary need any longer, but a luxury earned. Bravery, courage, and compassion for yourself and others champion the fear that the side of a mountain can make you feel. Butterflies, beetles, lizards and rabbits take on a role of luck and friendship, and perfectly place you in your favorite childhood movies. They calm your nerves, and along with a random footprint in the sand remind you that you're never truly alone. " Read the rest on his wonderful blog here. It's exciting to think about the wonderful conversations we've shared and comforting to know that i'ts still just the beginning. We've hiked roughly 800 miles, a huge chunk, but nowhere near complete. On another note, I want to give a shoutout to all of the people who took part in our pct experience from afar. We received letters, care packages, rides and food and numerous random acts of friends from our friends and loved ones, and it honestly lifts our spirits beyond anything else. Everything seriously means the world to us. If you want to send anything, I've put a link below to the holy grail of our addresses and schedule. Dates will change and be more accurate than what is on my blog (reach me section) because I can't figure out how to update that from my phone. Food and love are the perfect things to send. ALSO, I want to send you guys postcards, but in 2016 I hardly know anyone's mailing address, if you send me an email at rsterlingmontes@gmail.com with your address, I'll send you a post card (or put your address in the comments if you're comfortable). Stoked. Please share this with someone if you enjoyed reading along. We went live again on Facebook, from the top of Whitney at Sunrise check the link here. We glacaded from a 13,000 ft mountain, it was epic. We also swam in a freezing mountain lake. Check the vids below.